ORAL HEALTHY CARE: Mornwell Electric Water Flosser is Ideal for cleaning around dental bridages, braces and crowns; Removes bacteria deep between teeth and below the gum line where toothbrush can't reach; Massages and stimulates gums to improve circulation and keep your gums strong and healthy. SAFETY: Non-Contact Charging Stand is safe to prevent damage from water and spray,IPX7 Waterproof design avoid electric leakage, FDA certification for 360° rotated detachable nozzles, gives you powerful safety guarantee. 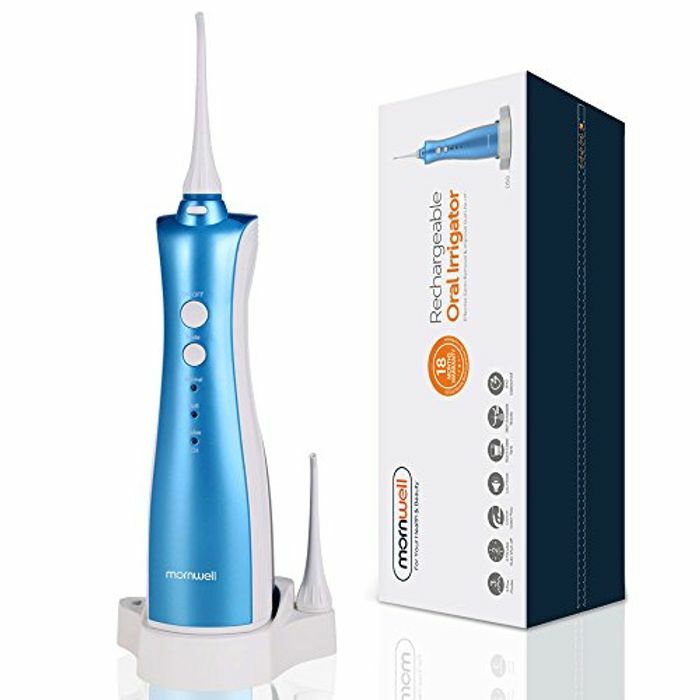 RECHARGEABLE AND PORTABLE: mornwell water flosser is designed to be lightweight, anti-slide and portable; Built-in 1400ma rechargeable lithium battery lasts for longer time than normal one; 2 minutes auto-timer function gets you rid of wasting energy.